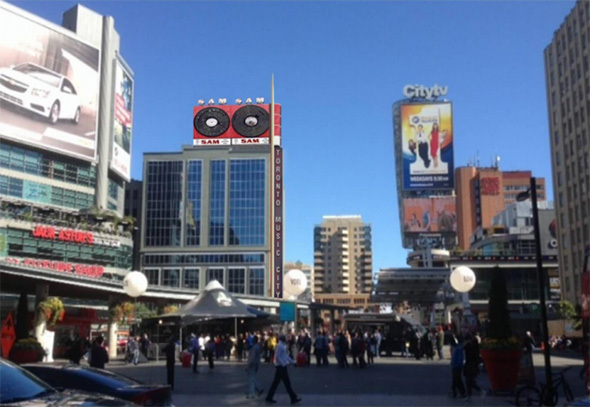 The iconic Sam the Record Man sign might be headed to Yonge-Dundas Square, according to a new report filed with the city. Currently sitting in the back of a tractor trailer at a sign shop in Vaughan, the sign has been meticulously catalogued for its future reinstallation. Just where and when such a return would be has remained a mystery since Ryerson University indicated it didn't have plans to make the sign a part of its fancy new Student Centre. The new plan would see the sign installed on the rooftop of the Toronto Public Health building at 277 Victoria Street. Yes, it looks kinda funny in the rendering, but it might actually be a great scenario for this lost bit of Toronto history. Yonge and Dundas is, after all, Toronto's most neon-clad intersection, and the sign would have a prominence that surpasses even its former home at Yonge and Gould. Along with the installation of the Sam's sign, the city would erect an additional sign hailing Toronto as "Music City." If there's a downfall, it's that the city has long term plans to sell the building, so the future of the sign beyond a decade would remain a question mark. One can only hope that a future buyer of 277 Victoria would see the old records as an asset. The proposal will be discussed at the June 19th city planning and growth committee meeting.